No doom for Dragons: Brian Elvis. 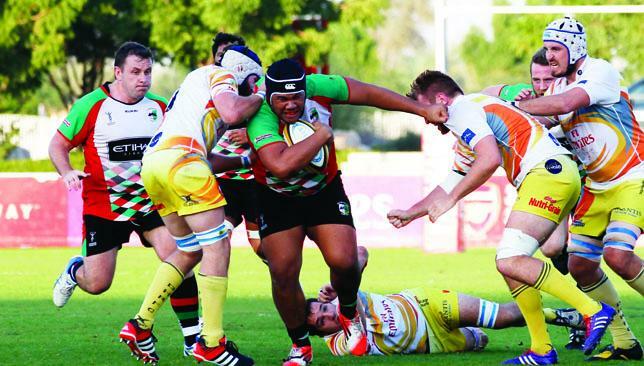 Jebel Ali Dragons duo Ryno Fourie and Brian Elvis believe the fallen giants of UAE rugby have to use their championship pedigree to get back to winning ways. The 2014/15 campaign was a disastrous one for the Centre of Excellence outfit, who followed back-to-back treble-winning campaigns with a plummet to earth. Dragons’ descent into mediocrity was both shocking and speedy, the player/coach duo of Murray Strang and Sean Crombie failing to yield further glory. Dragons stuttered in the Premiership, finishing fourth to amble into the Gulf Top Six. 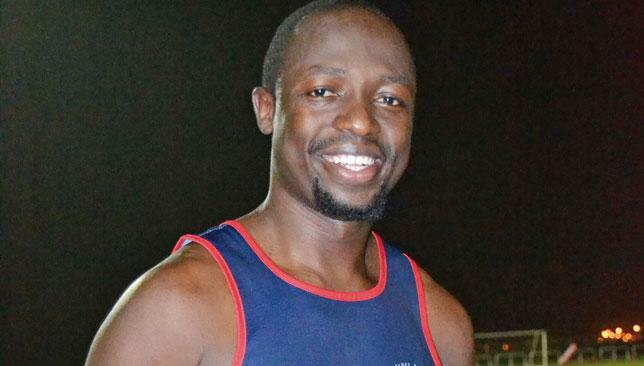 They faltered too at the Dubai Sevens, only making the quarter-finals. Meanwhile, in the post-Christmas pantheon of West Asia rugby they unravelled, finishing second bottom and winning just two of 10 GT6 games. They still have no coach as the new season approaches, while talisman Crombie has left the club, but Elvis and Fourie are upbeat about the challenge ahead. “It was horrible last year but hopefully we can pick it up. I’m looking forward to next season and hopefully we will be back contending for trophies,” said Elvis, 26. The Kenyan winger has been a Dragon for three years and says the club’s former successes can help drive them on to greatness again. “Confidence is high, you never lose it. If you’ve won trophies before you have to be confident,” he said. His optimism is shared by team-mate Fourie, who insists last year’s disappointment will act as a spur to get Dragons firing again. “It was a good learning experience. We won back to back trebles but it just gives us more motivation to build from here and show people we’re still a good club and we want to be back at the top and fight back to get our place,” said the 33-year-old full-back. “In the long run we want to re-establish the Dragons’ name but at the moment we’re focusing on getting enough players. Rob Simmons will miss the game against the All Blacks with a wrist injury. Wallaby lock and key lineout jumper Rob Simmons was Monday ruled out of the Rugby Championship clash against the All Blacks with a wrist injury that will need surgery. The 52-Test veteran will miss Saturday's match in Sydney as well as the Bledisloe Cup showdown against New Zealand in Auckland a week later. But he is expected to make a full recovery from the scaphoid surgery before Australia take on the USA in Chicago next month in the lead-up to the September-October World Cup. 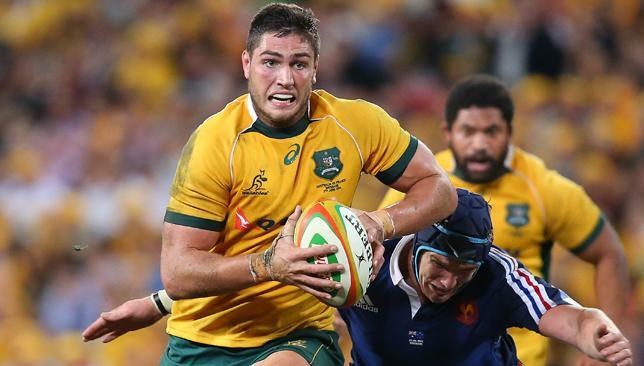 "Obviously we're all disappointed to lose Rob," said Wallabies coach Michael Cheika. "However, we're confident he will make a full recovery ahead of the Rugby World Cup. "We've been able to build some real depth in the lock position, and Rob's injury presents an opportunity for another player in the squad to stake their claim," he added. Former skipper James Horwill looks the most likely replacement in the starting team as no other player has been called into the squad for Saturday's game. Chasing the UK dream: Iziq Foa’i. Iziq Foa’i admits he feels “so close” to realising his dream of becoming a professional rugby league player following a successful trial with Super League side Warrington Wolves. The uniquely gifted New Zealander, who combines a battering ram physical presence with feather-touch handling skills, is heading back to the UK to chase a professional career in league. The club have offered him a chance to join up with their Under-19s team to finish the 2015 season in the north west of England. Although the future remains uncertain, with the 19-year-old using university and a degree in sports marketing or management as a secondary option should his rugby dream not come true, Foa’i is driven by positive comments from Wolves’ head coach Tony Smith and club legend Lee Briers, both of whom spoke glowingly of the teenager during his trial. “The club offered me the chance to come back after my exams, they’re keen to have me for the rest of the U-19’s season,” said Foa’i, whose absence will be a big miss for Abu Dhabi Harlequins this season. This was the latest in a series of trips to the UK the Kiwi has made over the last few years, having trained previously with Harlequins and St Helens, but Foa’i believes his Warrington trial was “make or break”. “This is the closest I’ve come to going pro,” said Foa’i.